– Liquor License Request, 3801 Central Ave NE, 7/11, transfer of ownership; Because CABQ Liquor Hearing Officer hearing is not yet scheduled no action is planned on this item March 11. *Motion made and passed to go to Closed Session. *Motion made and passed to direct NHNA President to establish special committee to develop policy and/or by-law on the issue. *Motion made and passed directing board member(s) to explore appealing Disciplinary Board of NM Supreme Court decision regarding complaint filed by NHNA. All are welcome Monday evening. Share your interests or concerns during public comment and share your ideas throughout. – Coming Solid Waste Transfer Station: We have written Councilor Davis saying we prefer Airport site over Milne Stadium site because Milne site has value for UNM/CNM uses and will create garbage truck traffic on Lead and Coal. – Community Form: Bosque Brewing Co, 106 Girard SE, administrative change of liquor license; NHNA sent the announcement to the listserve and received back 4 indications of support and 0 concerns; Tent on top of Imbibe: Residents ask that permits be checked. – University Heights Association letter to Mayor regarding ART: Do we wish to endorse or write our own? – Plastic bag ban in City Council: Do we wish to endorse? – Councilor Pat Davis invites requests from neighborhood associations for funding of studies, projects, and the like. Directors and other neighbors are invited to identify needs to the NHNA board for submission. Examples that have been brought up: landscaping the triangle at Amherst NE and Marquette NE, landscaping the triangle at Silver and Solano, bringing sidewalks up to ADA standards. Neighbors and Guests, please sign in at the front of the room. Come to find out what the NHNA is about! Tell us what issues you would like the NHNA to focus on going forward! Catch up with old friends, and meet new ones! Light refreshments will be served! The most important business items on the agenda are voting on amendments to the Bylaws and election of Directors to the Board. See our Bylaws page for more information on the amendments, so you can make an informed choice when you vote. We seek nominations for candidates for Directors. If you are interested, please send a paragraph describing yourself and why you are interested in being a Director to the Board of Directors (theboard@nobhill-nm.com). Any submissions received through Monday, Sept. 24th will have their names on the ballot and their paragraph will be distributed in print at the Annual Meeting. Nominations from the floor will also be accepted. The Information Fair will occupy the latter part of the meeting, where you can meet your elected representatives, learn about efforts to improve safety and traffic on Lead and Coal, and find out about water use, trees, urban farming, and recent changes to the zoning code. A summary of the amendments. The current bylaws are below (including a pdf version). The proposed Bylaws with amendments highlighted inline. The proposed Bylaws final draft. 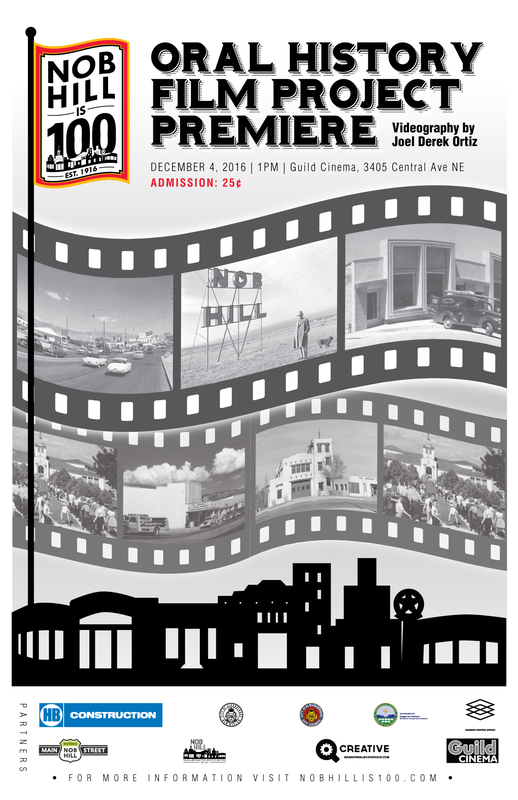 At long last the five short films produced in celebration of Nob Hill’s 100th birthday in 2016 are available for viewing.